The United Nations' cultural agency selected former French culture minister Audrey Azoulay as its new chief on Friday, handing her the keys to revive UNESCO's fortunes after the United States pulled out. 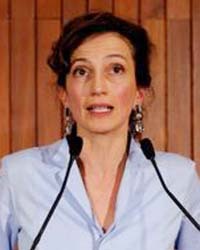 Azoulay edged Qatar's Hamad bin Abdulaziz al-Kawari after the fifth round of voting and the decision will now be put forward for approval to UNESCO's 195 members on Nov. 10. A sudden announcement on Thursday that the United States was quitting over perceived anti-Israel bias meant that whoever wins the top job would inherit a body in turmoil, with huge questions over its future funding and mission. "In this time of crisis we need more than ever to support, strengthen and reform UNESCO and not leave it," Azoulay told reporters, saying she would modernize the organization. "If I'm confirmed...the first thing I will do is to restore its credibility, restore the faith of its members and its efficiency so it can act." "Congratulations" France will continue to fight for science, education and culture in the world," President Emmanuel Macron tweeted.